In 1987, members of the East Point Woman’s Club stitched together a quilt to commemorate East Point’s Centennial. Each of the 49 squares helps tell the story of East Point’s history. The quilt is on display at the East Point Historical Society. Here is the fifth in a series of East Point history lessons, as reflected in a sampling of the quilt’s squares. Reflecting a growing and diverse economy, commerce and trade flourished in East Point throughout the 19th and 20th centuries. HEARSE: A.C. Hemperley & Sons Funeral Home was founded in East Point in 1904 and Howard L. Carmichael & Sons relocated theirs to East Point in 1922. In 2000 these two family owned and operated businesses merged. A lo-cation still exists on East Point Street. Gus Thornhill, East Point’s first Afri-can American police officer in 1965, now operates his funeral home in East Point’s East Washington neighborhood. As a child he washed hearses for the Walker Funeral Home, East Point’s second oldest funeral home that first served the black community in 1938. 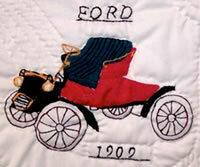 FORD: The Ford Motor Company produced the original Model A in 1903. By 1909, the ―model year‖ designation was in effect for the Model T, consid-ered the first affordable automobile that made transportation more acces-sible throughout America. A Ford dealership was established in East Point in 1925, thought to be East Point’s first automobile dealership. 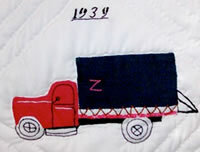 Z: J. N. Zellner and Son Transfer Company operated its family-based trucking company from the 1930s until well into the 1980s at its location near East Point’s railroad industrial complex. J.N. Zellner was also the freight agent at the Central of Georgia depot for many years.